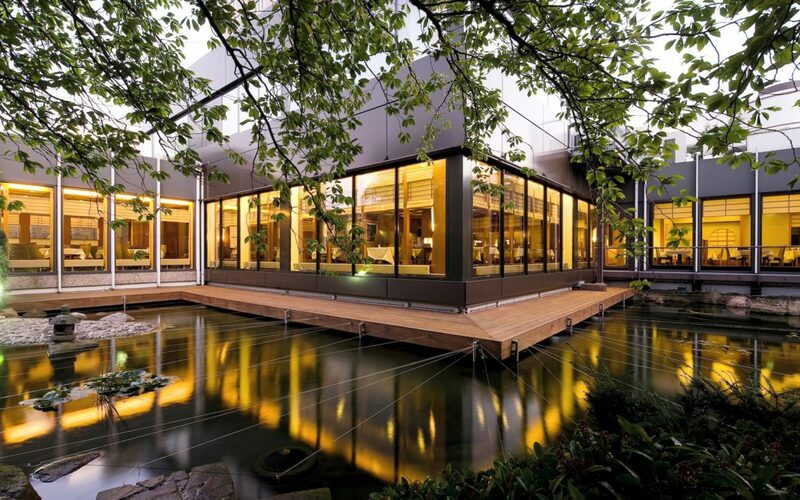 Yamazato, one of the restaurants at Hotel Okura in Amsterdam, has the distinction of being the first traditional Japanese restaurant in Europe to be awarded a Michelin star, under the guidance of Chef Akira Oshima, who became the first Japanese Michelin starred chef in Europe. That the Dutch would embrace Japanese food is no surprise; being a seafaring nation with global trade routes hundreds of years old, Dutch cuisine is a melting pot of international influences and a love of seafood is apparent everywhere you dine, as our dinners at Ron Blaauw and Bridges at Sofitel Legend Le Grand proved. I remember eating raw herring with my family in The Hague as a child, but at Yamazato the raw fish – and the pickles – are altogether more refined! Tucked away at the rear of the expansive hotel lobby, Yamazato has been modelled on the tea-ceremony houses of 15th and 16th century Japan, with wooden panels, linear decoration, pale colours and a Japanese garden just outside. 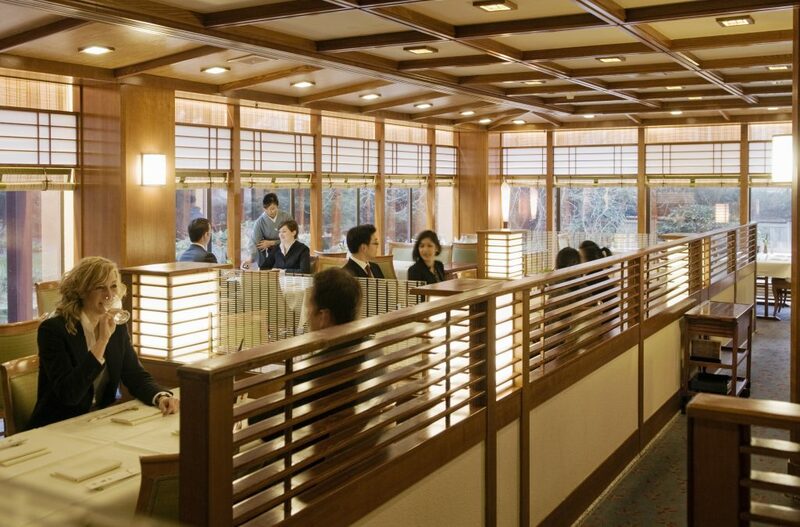 The waitresses are dressed in traditional kimonos and are reminiscent of geishas in their sparkling politeness. Charlotte and I dined with Marketing and Communications Manager Joyce Aerts, who informed us that a menu had been prepared for us, removing our apprehension about making wise selections from the array of delights on the menu. We began with a glass of Moët et Chandon with a dash of plum wine, a combination that I had never tried but that added a lovely sweet depth to the bubbles. Our first dish, ‘Sakizuke’, was anglerfish liver with Ponzu sauce, a fishy foie gras with a similar soft texture and tangy grated radish with vinegar. The ‘Zensai’ (appetiser) that followed was simply a work of art. At Yamazato, Chef Masanori Tomikawa ensures that the number of items and height of a plate are configured in accordance with the rules of traditional Kaiseki (Japanese haute cuisine). Chef Tomikawa took over the role of Executive Chef and Manager of the two Japanese restaurants at the Okura from Chef Akira Oshima in 2010, when Oshima moved into a role that took responsibility for the Okura’s Cooking Studio and the hiring of staff from Japan. 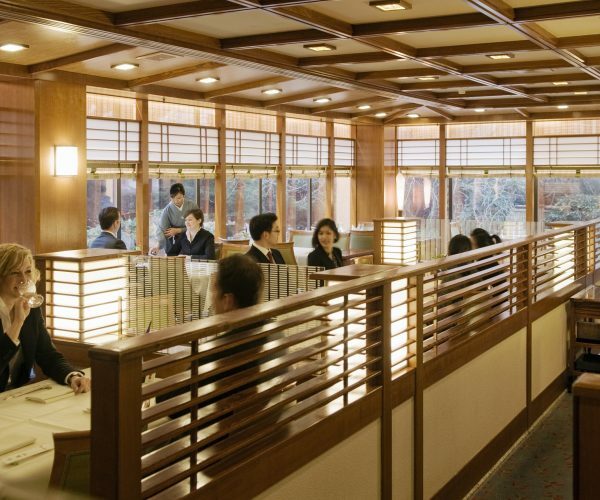 However, after working in the Yamazato kitchens under Oshima for 23 years, Tomikawa has the same dedication to perfection and this is evident in the precision architechture of the food. 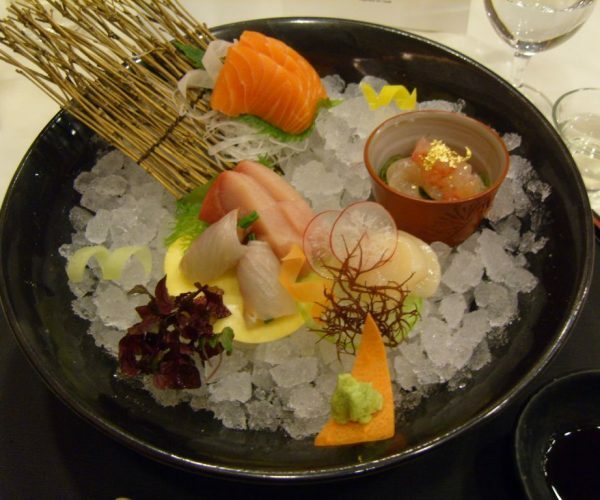 We were initially loathe to destroy the beautiful artwork of the zenzai, but hunger allowed us to overcome and we found each component of the course to be as divinely flavoured as presented. Salty, deep-fried brill was followed by sushi of shrimp and herring with cucumber, then tender simmered duck breast with glossy teriyaki sauce. Finally, there was simmered oyster, silky with sake, and a salad of surf clam with miso dressing, all of which was well paired with a fruity, crisp white wine. 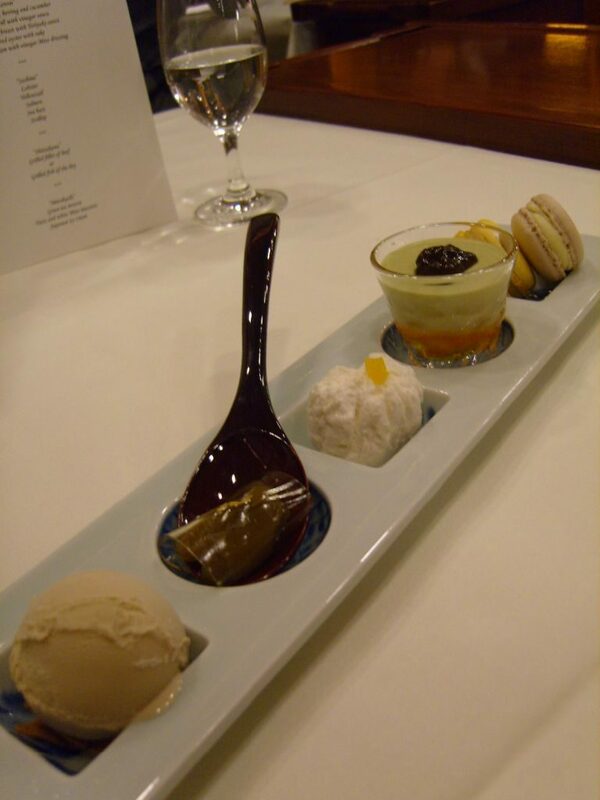 The sake in the dish started conversation about the different grades and varieties of the spirit. The sake menu at Yamazato is, naturally, extensive, managed together by Fukue Homma, who obtained her Kikisake-shi, the professional classification for sake sommeliers, in the same year she came to work for Yamazato. We were brought a cold sake to try, a Ginjo grade Masumi Kaden Tetsukuri from the Miyasaka Jozo brewery in Nagano. It was light and refreshing, cleansing the palate in preparation for the sushi course. 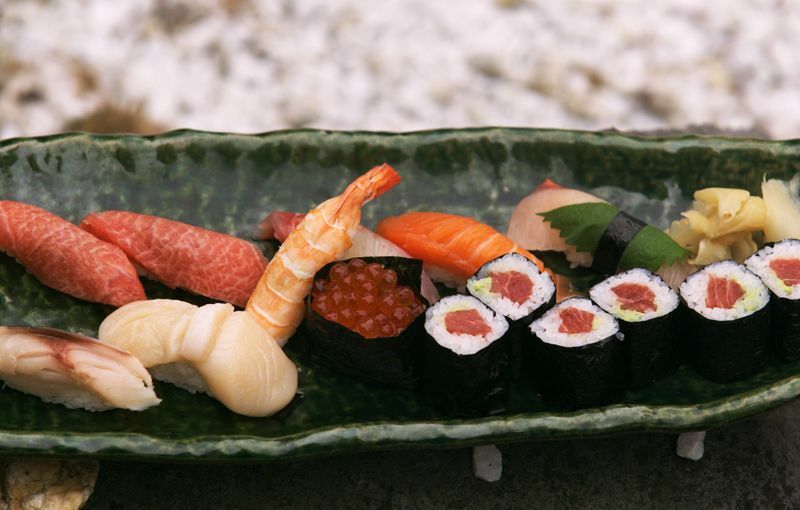 The sushi was a variety, including lobster, yellowtail, salmon, sea bass and scallop. 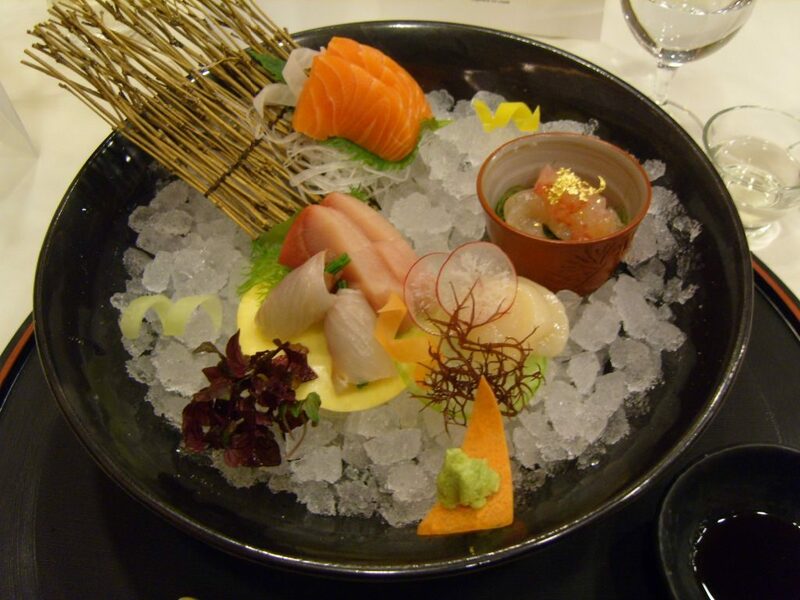 Of course, the dish was beautifully presented and each piece of sushi was immaculate and fresh. Chef Tomikawa personally sees and approves all the fish and the team at Yamazato took particular care to ensure that the fish suppliers understood how to handle the fish to a sushi chef’s standards, which are somewhat more exacting than is necessary if the fish is to be cooked. 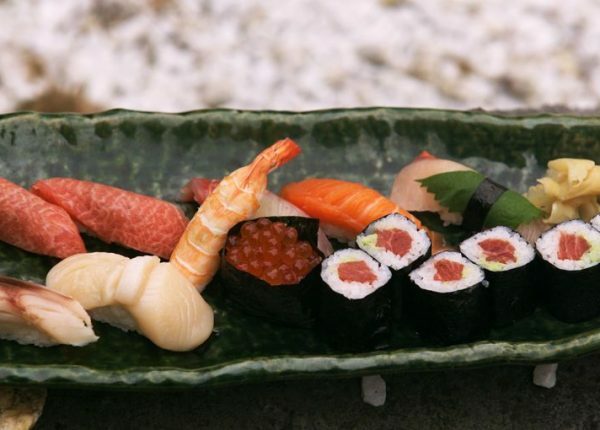 Good sushi – and this was exceptionally good sushi – has such delicate flavours and textures that each different fish seems strikingly different. 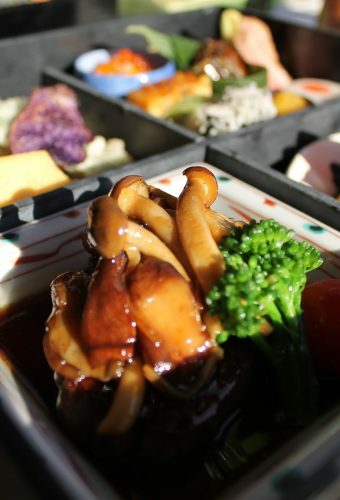 Japanese cuisine is not at all heavy, so one wonders if it is going to be enough to satisfy one’s hunger – but it always leaves me feeling very satisfied. Our next course was ‘Shiizakana’, a grilled fillet of beef with miso soup, rice, salad and pickles to accompany it. The meat was so tender that it seemed to almost give way once gripped by chopsticks and the sauce was rich and full of complex flavours. 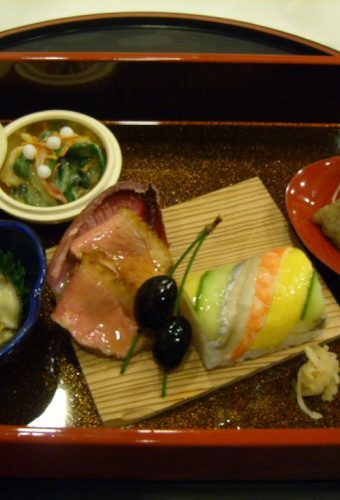 The miso soup had good umami, a pleasant savoury taste, which the sharp pickles complemented very well. Fortunately, Charlotte and I are quite proficient with chopsticks, but other cutlery was on offer so that the embarrassment of fumbling with one’s food did not detract from the dining experience. The wine was dark, opaque and woody, with a robust flavour that worked with the dish and did not overpower it. 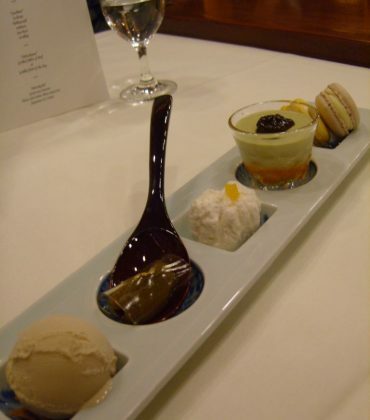 Dessert was another selection; an assiette of light and fluffy green tea mousse with Japanese ice-cream and two macarons. The ice-cream was pale in colour but was reminiscent of molasses and treacle. The macarons were yellow and cream, respectively yuzu and white miso flavoured, and quite as good as any that we experienced during our Paris macaron tour. 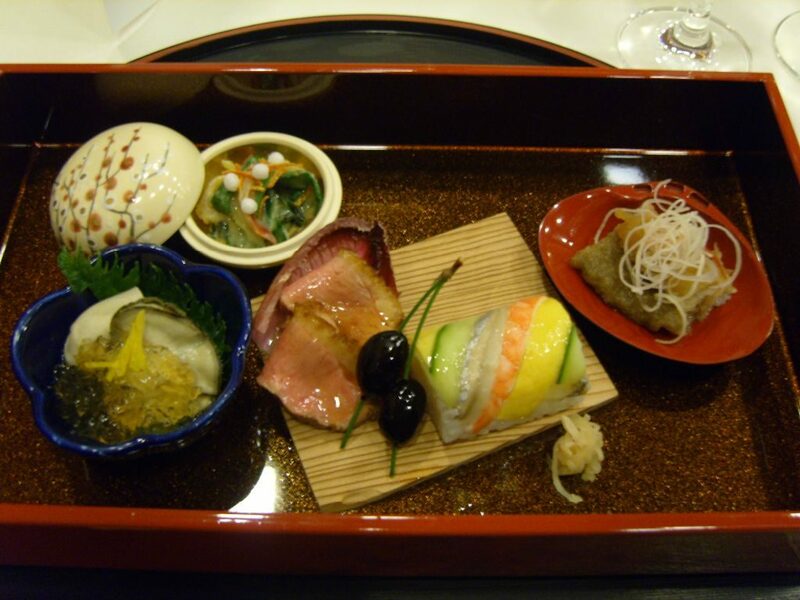 For anyone foolish enough to think poorly of Japanese cuisine, the authentic kaiseki experience, as presented at Yamazato, would be sure to change their minds. For us, the food did not only allow for a pleasant evening’s conversation but became the object of it as we marvelled at the carefully constructed dishes. 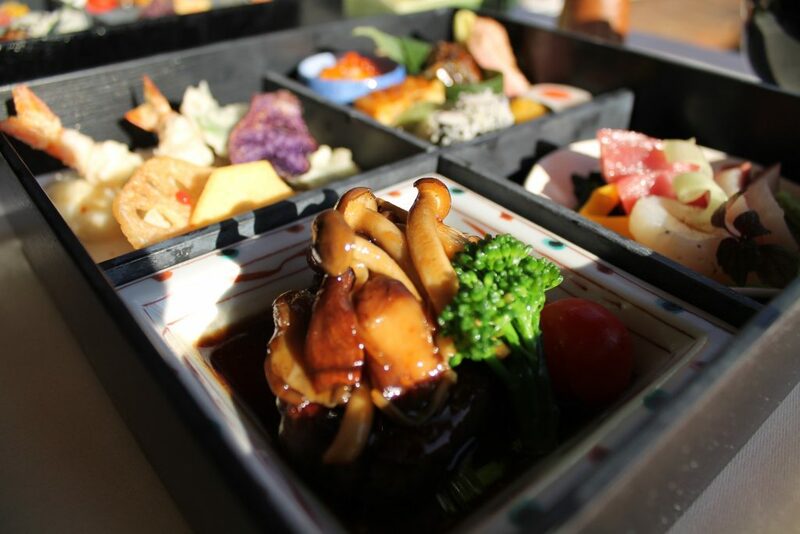 The intricacy of the cuisine is astonishing and, although we might not be able to enjoy Japanese food like it every day, this meal is sure to be a talking point for a long time to come.